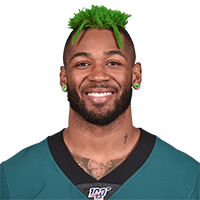 Published: Oct. 29, 2017 at 07:48 p.m.
Philadelphia Eagles cornerback Jalen Mills gets the pick six, nailing a 37-yard touchdown against the San Francisco 49ers. Published: Oct. 12, 2017 at 11:48 p.m.
Philadelphia Eagles safety Jalen Mills easily intercepts Carolina Panthers quarterback Cam Newton deep down the middle late in the 4th quarter. Published: Sept. 10, 2017 at 03:40 p.m.
Philadelphia Eagles cornerback Jalen Mills intercepts Washington Redskins quarterback Kirk Cousins in the red zone.